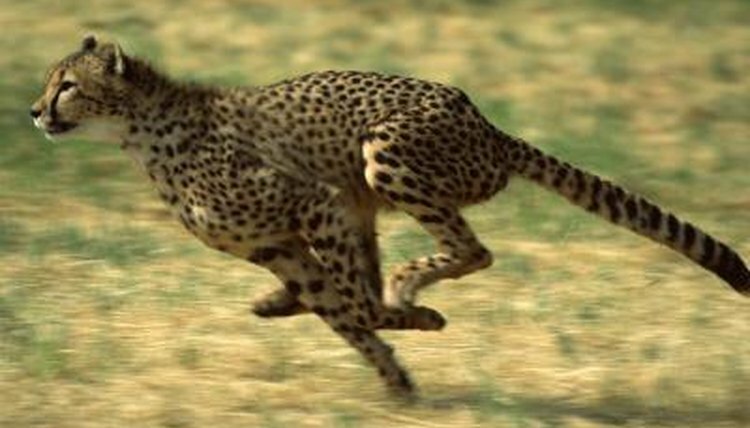 The cheetah (Acinonyx jubatus) is a large member of the cat family that is notable for its extremely rapid speed. These sinewy and uber-slender felines are actually the planet's speediest land mammals, according to the Smithsonian National Zoological Park. Cheetahs generally reside in the sub-Saharan region of Africa, often in desert, savanna woodland, scrub and grassland environments. These yellow or golden mammals are usually 3.5 to 4.5 feet in length, with typical weights of 75 to 145 pounds. Cheetahs possess smallish heads. Their bodies are conspicuously covered by large amounts of dark spots, and their faces display prominent black markings that travel from their mouths' edges all the way up to their inner eye regions. As far as diet goes, these carnivores eat a lot of gazelle, warthogs, impalas, kudu, birds and hares. They often go after mammals that have hooves -- and generally those that are below 90 pounds in weight. "Dad" cheetahs do not stay with the mothers after they produce offspring. The only time in which male cheetahs are around female cheetahs is during the physical act of mating -- nothing more and nothing less. Cheetah fathers are in no way involved with rearing their young, indicates Animal Diversity Web of the University of Michigan. They are innately promiscuous animals, with the goal of breeding with many different partners rather than staying with one and partaking in parenting activities. Cheetahs tend to be solitary and independent animals. Female cheetahs not only do not stay with the fathers of their offspring, they usually are alone except when caring for their little ones and teaching them hunting techniques. Male cheetahs, too, are generally by themselves, although they occasionally establish small units of fellow males -- usually siblings. These units typically consist of between two and three male cheetahs, and have the goal of strengthening defense in the face of any dangerous predators -- think lions, for example. The interaction between male and female cheetahs is limited to mating. No set "mating season" exists within the cheetah world. However, mating is especially prevalent during the most arid months of the year. If an "in heat" female is approached by a male, she may respond by grooming herself. The actual physical act of mating lasts for roughly one minute. Female cheetahs are generally pregnant for three months or so. Their litters typically consist of two wee cubs.